The Oak Lake Writers Society is pleased to announce Award-winning Oglala Lakota poet Layli Long Soldier as this year’s annual retreat mentor. The annual retreat of the Oak Lake Writers’ Society for tribal writers will be July 31 to August 2, 2019, at SDSU’s Oak Lake Field Station, near Astoria, SD. This year’s retreat focus will be poetry and publishing and culminate in finalizing pieces for the upcoming Oak Lake Writers Society anthology on Indian Humor. The public reading and potluck for the SDSU and Brookings Community will be held Thursday, August 1, at 6 p.m. at the Field Station. For more information or to RSVP, please contact us through the website at olws.squarespace.com or at oaklaketribalwriters@gmail.com. Elizabeth Cook-Lynn is the co-mentor and a co-founder of the Oak Lake Writers Society. Reprinted from Native Sun News with permission. These days few people want to take on the right-wing histories and the white superiority thoughts that seem to be reasserting themselves in the publishing, newspaper, and book world that many writers like myself contend with every day. Yet, we continue to foster the well-known authors and mentor the younger crop, in trying to make sense of our world. I say this because I just attended the SD Festival of Books as I do with enthusiasm every year, this year at Brookings, the seat of my alma mater, which initiates thinking about history. Some of us remember the 1960’s and the next decades when Noam Chomsky said America was guilty of grand theft, when Naomi Klein wrote about the disaster of capitalism, and Joan Didion took on professional football, and even Russell Means wrote about a place where “white men fear to tread.” It seems like all of that came about because ordinary people were given the chance to speak for themselves. And people wanted to read about what they had to say. At the Festival, I was invited to read from my latest book, which I am calling a memoir and I was seated at the book signing between two white male classically trained historians born and raised in South Dakota. Neither of them was restrained about their own estimable credentials and, of course, neither of them had ever read anything I had written. Gary Clayton Anderson, with an M. A. from the University of South Dakota, who is now the George Lynn Cross Research Professor of History at the University of Oklahoma specializing in ethno history and the history of Native Americans of the Great Plains and American Southwest, was there to talk about his latest book Gabriel Renville: From the Dakota War to the Creation of the Sisseton-Wahpeton Reservation, 1825-1892, released just during the festival. It is a subject matter much written about by historians of all stripe. Since I grew up living with a grandmother from that reserve who was one of the relatives of Gabriel, I had heard the stories of that history all of my life, and I went to Anderson’s presentation with great anticipation. It was a disappointing discussion not only because he regaled us with the idea that Patriot Chiefs like Renville were those who were interested in making the best of a bad time. They were not like those who led resistance wars. Thus, not a word about Little Crow and certainly nothing about Inkpaduta was in his work. I thought it was a bit one-sided and maybe even a wrongful interpretation of history. Generally speaking, classically trained historians try to curtail and restrain the stories about the dangerous impulses of Indian opposition war leaders, so the less said about Inkpaduta, I guess, the better. Who is a Patriot Chief, I wondered? The one who tries to be accountable to Congress and the general public? Or is a Patriot Chief the one who leads the tribal-nation resistance? That is, of course, the polarization that clouds all of our Indian stories, and our histories, and it seems to me to me that historians should not be too ready to edit themselves before telling the whole story. It is possible that the reading habits of contemporary America, like everything else, are changing. Maybe we’d rather not face up to the past and so we say to ourselves, there’s too much reality here…. let’s read and tell a different story! History as we see it these days is returning to the idea that “classically trained” historians will and can and should revive the tradition of focusing more on diminishing any kind of opposition to their and our origins. That idea seemed to run counter to the work and the writers of many of the major voices of today such as Joseph Marshall III whose latest work In the Footsteps of Crazy Horse has been on the list of 52 Library best reads for 2018, to say nothing about the 30 or 40 books of Vine Deloria Jr.
Another history, A World without Reservations by Ben Reifel, the only Sioux Indian ever to be elected to Congress from South Dakota, was also on the agenda and was presented by Professor Sean Flynn of the Dakota Wesleyan University in Mitchell. Flynn is probably better known to local audiences for writing a book called Marine Corps Warrior about his father. This presentation and book at the festival was accompanied by a Briggs Library display and exhibit of Reifel’s life and career and many of the history buffs at the festival made a trip to the showing. Reifel was a controversial figure at the time he was writing and serving in Congress because he was an advocate of enforced assimilation and a supporter of the state inspired movement of the 1950’s and 60’s called “State Jurisdiction” a nationwide “Termination” idea directed toward crushing the burgeoning native nation nationalism. The Termination Policy was bitterly fought by the tribes all across the country and was defeated. A more rounded picture of that period is rendered in a book now ten years old titled Not Without Our Consent by Dr. Edward Charles Valandra (University of Illinois Press) that documents the resistance to Reifel’s political position. As expected, Prairie Fires: The American Dreams of Laura Ingalls Wilder (by Caroline Fraser) was much-anticipated by festival goers because it has been touted as “an excellent biography which “refreshes our understanding of American history from Native Americans to the Homesteaders that replaced them,” according to several reviews recently available. In the view of that book’s many readers, it seems quite remarkable that Ingalls Wilder, an unknown farm wife, discovered her poetic voice and was inspired to write this experimental meditation on the imagined country life of the American experience. But to suggest that it “refreshes our understanding” about the reality of Indian Life in 1867, when she was born and in the subsequent years as she was traveling across the west, is absurd. It is not a useful discussion of frontier policy. Its characters hate Indians but seem to know little about the distinct societies of people who had lived on this continent for thousands of years. This is a family story that has become memorable entertainment television, like Lost In Space and Ann of Green Gables. It is a writer’s performance in historical writing about Indians and Whites that is so bad historically speaking, it may be seen as intentional mockery. In the story there is a steady refrain of casual racism and misogyny and even white superiority and reactionary politics. We know that the writer and her forebears thought FDR should be assassinated because of federal government interference in the lives of those who were encroaching in treaty-protected areas, were against his plan for social security protection for all citizens, and she simply told stories of her relatives who hated Indians. To share our lives is what writers do. The struggle goes on to write history and to know our selves as Americans. The SD Festival of books is a marvelous way for educators, writers, parents, and students to gather each year to view not only our histories but to take stock of our futures. New writers appear at the festival and are welcomed into the world of book lovers. The newest children’s book writer, Jesse Taken Alive Rencountre, from the Standing Rock Sioux Tribe who counsels in the Rapid City School District, introduced her new beautifully illustrated new children’s book Pet’a Shows Misun the Light and has been named the Great Plains Emerging Tribal Writer of the year. As comentor and co-founders of the Oak Lake Writers Society, I continue to believe that writing is one of the important activities for us to use to come together. The OLWS panel was Friday, September 21 @ 11:00 to 11:45, “Oak Lake Writer's Society: A 25th Anniversary Conversation.” Elizabeth Cook-Lynn headlined with her latest publication: “In Defense of Loose Translations.” Tasiyagnunpa (Livermont) Barondeau and I as Oak Lake members joined Elizabeth in the conversation. Elizabeth gave a heartfelt thanks to Dr. Chuck Woodard who has believed in and supported OLW through the years. We as members of OLW concur wholeheartedly. Chuck moderated our session and gave a brief but thorough review of the 25 year history of OLWS. We each shared the significance of what Oak Lake Tribal Writer's Society has meant to us personally. Chuck lead the conversation into how White folks often do not want to own the history of how this Nation came to be. He went onto say that White folks prefer the idea that this was all in the past. White folks do not want to carry the guilt of the past. Chuck went on to say that White folks have a responsibility for current attitudes, rather they choose not to take ownership of the past. This opened the door for me to share the words of a White friend. This friend had the opportunity to attend several events with Lakota, Dakota, and Nakota. She stated that she had always had the attitude that she didn't kill or harm anyone, that was all in the past with her ancestors. Why should she carry the guilt of her ancestors? She went onto say that as she befriended many Native people; began to experience our culture, she realized that she had taken on the attitudes of past generations. She carried the negative stereotypes of her ancestors that influenced the way she thought of Native people. She made a public apology to the Dakota 38 + 2 when they rode through Madison, South Dakota in 2011. It seemed appropriate to share this story in support of Chuck's statement challenging White folks to evaluate their current attitudes and take responsibility in the now. Gabrielle Tateyuskankan arose from her chair as I finished; she spoke with authority to the mostly White audience. Gabrielle also is a longtime member of OLWS. I pondered much over her words that were bold and truthful. I admired her ability to speak with candor and without fear of any type of retaliation. I will try to capture what I heard her say. I only hope I can write the message she gave in a manner that honors Gabrielle. The following is my paraphrase as to how I remember and understood her words. Gabrielle made the point that if White people feel guilt; they should!! The current wealth of this Nation was acquired by the suffering of our ancestors, our grandparents. She had much more to say, however, the reality of her words was that current White wealth is enjoyed due to all that we as Indigenous peoples have suffered, ie. All that was stolen! Gabrielle had much to say about the current President. She compared him to Andrew Jackson. As one looks back at history, it speaks loudly for itself! What more needs to be said? I was impacted by her powerful statement that confronted many who look the other way as Trump leads this Nation by deception and immorality. As I began writing my thoughts for the OLW Blog; I re-visited the theme for this 2018 conference: WHAT'S TRUE, WHAT'S FALSE & WHAT'S IMPORTANT? I believe Gabrielle summarized for us the theme of this conference. Gabrielle spoke truth, she addressed what is false and what is important to us as the First Peoples of these indigenous lands. And it should be important to all people of this Nation. The final session I attended was “Screening and Discussion: Return to Rainy Mountain,” with Jill Momaday, regarding her beautiful tribute to her Kiowa people. Deeply moving. It was an honor to meet Jill, a sweet, genuine, kind spirit. As I watched the documentary, so many images of growing up with many grandmothers and grandfathers in my Lakota community (tiospaye) near the Little White River, Mellette County, South Dakota floated across my mind. Deeply grateful, wopila for Jill's work. I came away with a knowing that telling our stories must continue. And Oak Lake Tribal Writer's Society must go on; the work we do is important! My research interests focus upon American Indian literature, specifically modern/contemporary Dakota and Lakota literatures. Therefore, I was excited to be asked to coordinate the Oak Lake Writers’ Society’s annual retreat for tribal writers. The retreat, which is sponsored by South Dakota State University, is scheduled Sunday, July 29 through Thursday, August 2, 2018. This year’s writing mentor is Virginia Driving Hawk Sneve, a member of the Rosebud Sioux Tribe and an SDSU alum. She has published more than twenty books on American Indian culture and history, poetry, and fiction and non-fiction books for children. At the retreat, she will discuss her books Completing the Circle (1995), and Grandpa was a Cowboy and Indian (2000), and explain the process of writing and researching family stories, and also experimenting with different literary forms and genres. On Wednesday, August 1, writers will share the work they completed at the retreat at an annual community potluck and reading. The potluck will begin at 6:00 PM, and readings will start at 7:00 PM. This year’s reading will begin by announcing the winner of SDSU’s Emerging Tribal writer award. Established in 2013, the Emerging Tribal Writer Award, like the Oak Lake Writers Society, is intended to increase the number of Dakota, Lakota, and Nakota writers publishing and presenting in the Great Plains region. For centuries, Dakota, Lakota, and Nakota voices have been silenced by EuroAmerican writers who often intentionally/unintentionally perpetuate the myth of the “Vanishing Indian,” which suggests that tribes are ancient, primitive, and extinct. Dr. Charles Woodard and Elizabeth Cook-Lynn, who established the group in 1993, rally a group of 10-15 writers to meet for several days at the Oak Lake field station near Astoria, SD, to combat this dangerous and pervasive myth. At the retreat, Dakota, Lakota, and Nakota writers work closely with prominent American Indian writers to sharpen their craft, learn from one another, share their stories, and present and publish their the work. Previous mentors include 1969 Pulitzer Prize winner N. Scott Momaday, whom many literary scholars credit with launching the Native American Literary Renaissance of the 1970s. Over the years, other mentors include James Welch, Susan Power, Heid Erdrich, and Cook-Lynn to name a few. 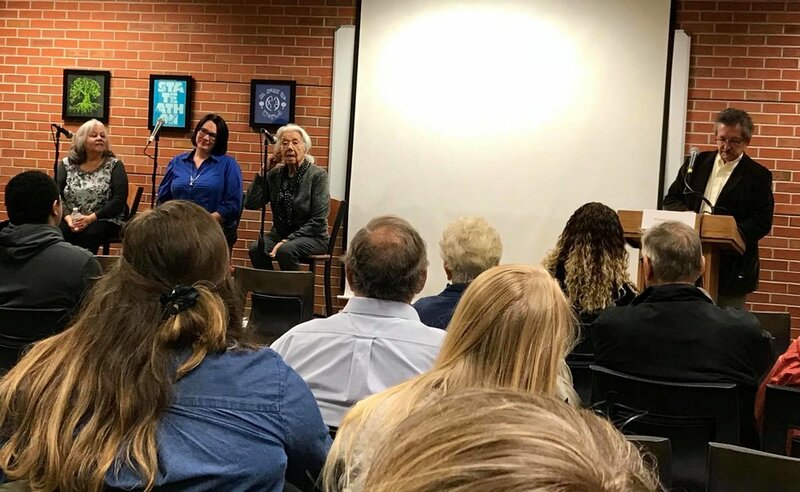 Cook-Lynn has regularly mentored the group since its inception, often emphasizing the importance of using tribal writing to challenge American Indian stereotypes and assert an empowering Native voice. Collectively, the Oak Lake writers have published three books: He Sapa Woihanble, Black Hills Dream, The Stretch of the River: Lakota, Dakota, and Nakota Responses to the Lewis and Clark Expedition and the Bicentennial, and Shaping Survival: Essay by Four American Indian Tribal Women. He Sapa Woihanble, Black Hills Dream. Each book allows writers to assert the Native voice and to offer insight into historical events that attempted to silence that voice such as the theft of the Black Hills, the desecration of the Missouri River, and the Boarding School Movement. I teach these books regularly in my classes at SDSU because they highlight the tribal perspective and emphasize that we are still here. Most importantly, these books provide significant insight into an aspect of South Dakota history that many other writers downplay and/or ignore. As an educator, I firmly believe that we need to acknowledge this history so that our communities – both Indian and non-Indian – can start to heal from these losses. Post originally published on CAIRNS, The Center for American Indian Research and Native Studies, directed by Dr. Craig Howe, a longtime OLWS member. As a new member, first-time attendee, and young Native scholar of the Oak Lake Writers’ Society annual retreat, I came to this group influenced by these writers’ works and vision. These are my insights and takeaways from the retreat, being in the presence of colleagues and accomplished senior writers. Tucked away in quiet, relative isolation along the southern shore of Oak Lake in northeastern South Dakota, the Oak Lake Writers' Society (OLWS) met early this August for its 22nd annual retreat. Each year, Lakota, Nakota, and Dakota writers of all ages attend for four days of writing workshops and meetings. The planned Rainbow Family of Living Light gathering (herein Rainbow) in He Sapa, the Black Hills, has caused serious tensions within the Oceti Sakowin. Many of us see the Rainbow gathering as engaging in cultural exploitation, and some of their activities as desecrating our holiest site by appropriating and practicing faux Native ceremonies and beliefs. These actions, although Rainbows may not realize, dehumanize us as an indigenous Nation because they imply our culture and humanity, like our land, is anyone’s for the taking. As outsiders to our Nation and struggles, the Rainbow gathering has caused and will cause more harm than good. Some argue that Lakota and Dakota nations need to choose sides on whether or not we should support the gathering. These same people have also attempted to form an “alliance” with Rainbow attendees by publicly welcoming their presence and supporting their encampment in the hopes of facilitating an occupation that would in turn demand the return of stolen treaty lands in He Sapa. Other Lakota activists have set up a protest camp and have called for the eviction of the Rainbow camp over fears of desecrating a sacred site, the cultural appropriation of sacred Native ceremonies, and the violation of the 1868 Fort Laramie Treaty, which reserves exclusive use to He Sapa for the Lakota, Dakota, and Arapaho nations. While sympathetic Lakota “allies” and supporters are concerned about making the Rainbow attendees feel comfortable, a simple fact remains: the tens of thousands of Lakota and Dakota people currently living in He Sapa and those who make annual pilgrimages for ceremonial and cultural obligations are not made to feel comfortable, at all. Those Lakota and Dakota people who live in Mni Luzahan, Rapid City, a notoriously racist border town, for example, experience the highest rates of poverty—nearly fifty percent—more than any other urban demographic in the nation, and higher than many American Indian reservations. Natives also make up twelve percent of Rapid City’s population but account for three-quarters of the homeless population and half the county jail population. Paradoxically, Rapid City economically depends on Lakota and Dakota business from surrounding communities and reservations. The annual Lakota Nation Invitational basketball tournament, for instance, is the second largest money-maker for the city, next to the Sturgis Bike Rally and the He Sapa Powwow. Yet, the history and pervasive anti-Indianism directed at Native people who visit, shop, and live in Rapid City is nothing short of an outrage. As a Nation of intellectuals, writers, artists, professionals, and educators, the Oceti Sakowin has much to celebrate in our achievements and contributions to our national culture and to politics. Aligning with the Rainbow Family, a group that cites a fictitious “Native American prophecy” as informing their self-identification as “warriors of the rainbow” and willfully appropriates Native cultural practices, is not only adventurist and dangerous, but offensive to many of us who advance and continue to defend the spiritual, the cultural, the sacred, and, most importantly, the political vitality and vision of the Oceti Sakowin. In a recent letter to the editor in Indian Country Today, one Rainbow member justifies Native appropriation: “I see how cultural and spiritual appropriation is disrespectful and harmful but I also see how the actual practices heal and rebalance everyone,” as if “everyone” is in need of rebalance. The sense of entitlement to Lakota and Dakota spirituality and culture illustrates a common belief of white settler society: like it was entitled to our land, it is therefore also entitled to our culture and our humanity for its own benefit. The U.S., a settler nation, was built violently upon this myth: white people who feel they lack meaningful ancestral ties and relationships to this land turn to new forms of theft. Our remaining land, sacred sites and cultures are open for plunder and theft as whites seek spiritual meaning and personal self-actualization. They may need “rebalance” after the the colonial atrocities of white society. We need what we have always wanted, the dignity and right to exist as an indigenous Nation in our homelands. How does Rainbow further this other than to mock and appropriate our culture? White settlers who appropriate Native cultures for their own benefit do not advance nor align with the values of Wolakota, the Lakota and Dakota way of living, values that have been passed down and protected by our ancestors. In fact, it furthers the belief that Native peoples and cultures exist for pure entertainment and ownership for white settlers, a belief that saturates the popular imaginary in the form of racist sports mascots and other dehumanizing caricatures, and fantasies of perceived or fabricated Native ancestry. The appropriation of our sacred spaces, practices, and our very identities violates us as a people, a nation, and it violates our sovereign right to determine for ourselves who we are in this world and this universe. It jeopardizes our legal, political, and spiritual claims as rightful caretakers of the land and He Sapa. As Dakota and Lakota nations, we have been tolerant to other worldviews and have even come to accept some of them, as taught through Wolakota. This has been our greatest strength and our greatest weakness—because it is often exploited. In the past and currently, we strategically align with other Native and non-Native people and causes when it is in the best interest of our nations and the land. These alliances are necessary for our continued survival and for seeking justice for historical and ongoing wrongs. There are non-Natives who are sympathetic to and allied with our causes, but who do not find it necessary, nor should they, to appropriate and distort our cultural practices, and traditions for their own benefit. When Ptehincala Ska Win, the White Buffalo Calf Woman, gave us the canupa, the pipe, and our sacred ceremonies, she gave them to us, the Oceti Sakowin, not to anyone else. She gave us specifically a burden to bear, that we as a people should guarantee our survival and continuance as a Nation in our own lands. Ptehincala Ska Win’s message was for us to stand as one nation, whether we disagree or not. When the U.S. and occupying forces ripped us from our homelands, forced us onto reservations, and attempted to destroy us as a people, those burdens of genocide became ours, and they also became everyone’s responsibility to help right these ongoing crimes against humanity. Appropriating our practices and sacred spaces does not right historical wrongs. It adds to them. Uniting with the Rainbow people, whose gathering in our most sacred site promises only further cultural and spiritual exploitation, has fractured us. It has sown seeds of disunity at a time when we desperately need unity to combat the exploitation and violence against our land, water, youth and women, and the continued desecration of our sacred sites at places like Mato Paha, Bear Butte, where hundreds of thousands of mostly white bikers gather for weeks of debauchery at the Sturgis Biker Rally during our ceremonial season. Do they understand the power of these hills, of this place? Or is it simply a piece of earth they roar into once a year and which they objectify for their pleasure? Although the Rainbow gathering has a veneer of “spirituality” one could ask the same question of them. And we do, as individuals whose peoples arose as peoples in this place, and who have been powerfully connected to it for millennia. Let’s use our hearts, minds, and bodies towards continuing these struggles instead of aligning ourselves with cultural exploiters and those who detract from the long, hard task of unity as a Nation. Reprint permission: Please print as is. For a thousand-word version for print, please leave a comment with your publication name and contact info, and we will get back to you. On the third day of the Oak Lake 2012 retreat, University of Illinois Associate Professor of American Indian Studies Jodi Byrd (Chickasaw) led a fascinating session by this name. We got down to analytical business pretty quickly and discussed how the zombie/demon/monster narrative, along with Christianity, is a founding myth of the United States. Our tribal writers, most of whom work with more traditional genres (and I don’t necessarily mean “traditional” in the tribal sense here), nonetheless were very lively participants in Jodi’s session. She explained the links between such narratives, both in film and in (video) gaming and how Indians get designated as monsters. Alternately Indians get erased and the landscape gets represented as empty in many such works. These are ways in which they resonate with more traditional forms, including captivity narratives and westerns, for example. She noted that a surprising number of video games have Indian motifs of both violence and erasure. She cited a game called Prey that features the “agnosia” she spoke of yesterday—a term she borrows from neurological science, a form of blindness in which one’s eyes can see but one cannot comprehend what one sees. In this game a Cherokee named Domasi "Tommy" Tawodi traverses a treacherous landscape to defend the land from invaders from space, aliens. As Jodi points out, "the use of 'prey' is a double entendre of savage Indians on the one hand, and the fact that the invading aliens have upended the food chain and surpassed humans at the top." Jodi argues that it is incomprehensible that the character Tommy could be defending the land from invaders from Europe, from colonialists. I asked what demographic creates games. Jodi responded that the majority of game developers are white and Asian males. Again, agnosia: Colonial violence and history—even what one sees before one’s eyes—cannot be comprehended. Overall, I think our writers found this a useful analytical intervention. Gabrielle Tateyuskanskan noted a slightly different—perhaps related problem. In mainstream classrooms Indian students “analyze in silence” the dominant narratives we’re fed, for example, of Indians as consorting with faeries (i.e. in Peter Pan) and therefore as not real, or Indians as absent from a landscape in which historically there was tremendous encounter and violence (e.g. Little House on the Prairie). The Oak Lake Writers’ Society (OLWS) is holding our annual retreat again this late July and early August out at South Dakota State University’s Oak Lake Field Station near White, South Dakota. We come together for five days of conversation, writing time, and a Thursday evening reading that draws folks from Brookings, home of South Dakota State University, who are interested in Native American literature and the humanities. Our writers’ group is a mix of academics from state universities and tribal colleges, high school teachers, teachers working with youth in the criminal “justice” system, retirees, students, and activists—all members of Oceti Sakowin peoples, in English, the “Sioux Nation.” Our conversations range far and wide. We encourage and challenge one another. Some of us have more expertise dealing with the hierarchies and challenges of higher education, some of us more expertise dealing with the rigors of tribal politics, some of us more expertise in areas of traditional cultural production. But we are all “tribal voices” (to emphasize Cook-Lynn’s notion that it is necessary for such voices to engage key narratives and issues) within our broader cultural group. This is perhaps the chief thing I appreciate about this group in which I think it is safe to say we each feel challenged and nurtured: our diversity, our different life and professional choices, and our general tolerance for one another alongside our commitment to promoting Oceti Sakowin standpoints on history; contemporary tribal life; social justice and environmental issues; local, regional, and world events. Today we had two great conversations. Our mentor this year, University of Illinois American Indian Studies (AIS) Associate Professor Jodi Byrd (Chickasaw Nation of Oklahoma) (co-mentor with Elizabeth Cook-Lynn, our always mentor), sparked lively discussions about indigenous epistemologies in critical writing, and strategies for dealing with writers’ block. On the indigenous epistemologies front, we discussed and debated the idea of the Great American Indian novel (or great tribal-specific novel), a conversation that was a bit over this social scientist-turned-creative-prose-writer’s head so I will not do it justice. Does such a genre exist? Is it an important literary form to be articulated? Should it be articulated and theorized at that pan-Native level or at people specific levels? (Comments are welcome from other writers who partook in that conversation who might clarify this summary.) Jodi noted that the (great) American novel was symbiotic (my word, not hers) with the rise of U.S. nationalism, a form of literary nationalism. This comment caused our group to think hard then on the merits of the great American Indian novel or tribal specific forms in the cause of tribal nationalisms. To quote our mission statement, our group exists for the very purpose of preserving and defending Oceti Sakowin cultures, oral traditions, and histories and to reaffirm our peoples’ political statuses. We seek to regulate and transform representations of our peoples and histories that are inaccurate and damaging. Thus we produce and promote works across genres in a manner that will bring about a greater understanding of our cultures, legacies, and lands.I’m not sure we came to any conclusions. As someone who does social studies of science and who thinks about the intersections of scientific knowledge production, colonialism, and Native American governance, I was reminded in this conversation of the symbiotic rise of scientific narratives and methods with federal policy and nationalist politics in the 19th century. These things are all connected. My fellow writers, almost all of whom have more knowledge about fiction than I do, reminded me in their animated conversation of my biological scientist friends with their will to categorize literary forms into genres, then in other moments they wrestled with the inevitable smearing of genres and fields that we encounter today. The writers’ block conversation in the afternoon also revealed a key insight. As Native writers, we decided our blocks are less internal than external. We felt we have no end of topics to take up from our tribal standpoints (this conversation also came on the heels of a discussion about Said’s term “contrapuntal” thinking—that one must read against the larger imperial context that informs the emergence of text). Rather, for us, the challenge is often to narrow our work sufficiently for the piece at hand. And we struggle to find language and terms that are culturally/tribally grounded but yet also speak to non-native readers. A final key point of debate was how much do we care about speaking to non-tribal audiences and why or why not? What is the function of speaking to tribal audiences, and what is the function of speaking to non-tribal folks. It is not news to most in academia that a wave of anti-intellectualism has pervaded the American public discourse for well over the last decade. This is as troublesome to tribal scholars, academics and writers as it is to many others elsewhere in the American intellectual landscape, however, as we discussed during this year’s Oak Lake Writers’ Retreat, perhaps we take it a bit more seriously. Since a good deal of the Oak Lake Writers’ Society’s mission is “to reaffirm our peoples’ political statuses,” we cannot allow ourselves as tribal citizens to be swept away in this tide of American anti-intellectualism that obscures and masks the facts, issues and problems of our time and that of a history that, as Elden Lawrence shared with us this year, we may not be responsible for, but are most assuredly, responsible to. The public intellectual seems to have a shifting definition according to what has been written about it in the last couple of years, but overall it indicates a person of some higher (undergrad) or advanced (ph.d) education, a person of research, a person who applies themselves to the issues of their communities, and often writes materials that are accessible to the general public in which they see themselves a part of. Since I can let you google this idea to your heart’s content, let me describe how this might shape up for a young member of the Oak Lake Writers’ Society, by sharing how I was deeply challenged and inspired by this idea. As I write this early on Thursday morning of the retreat, I am actually soon heading my vehicle westward to home. Balancing the needs of my young family as I start a new position on Monday as editor of a weekly newspaper in the midst of Indian Country, I will be heading home with plenty of driving time to further consider this idea of the tribal public intellectual. While the Oak Lake Writers’ Society is gifted with amazing academics from various disciplines, many of us are simply writers, journalists, poets and storytellers telling, caring and shaping narratives based in critical thinking and tribal knowledges. I think for me, I always sought the way of learning and ‘well-roundedness’ in college. Add to that my desire for motherhood and other civic duty, and I think that we can begin to see a person aspiring to the most simple level of the public intellectual. Even though citizenship by definition is an introduced colonial idea, it is still a form workeable and understandable to the average tribal member. Coming from the Oceti Sakowin Oyate, where relationships and defense of the people was well understood, we seek to continue that heritage. For the Oceti Sakowin Oyate, commonly called the Sioux Nation, we must have those public intellectuals that can drive, stimulate and address the conversations needed for a robust, educated, thoughtful and active tribal citizenry. While most of us express our citizenship as members of federally-recognized tribes scattered onto reservations across our original lands and lands that still should be ours according to treaty, those of us willing to begin these conversations in our communities, whether rez or off-rez, should begin aspiring to this idea of tribal public intellectual. Then we can send them back out, the intellectual warriors that they are. Some of our academics do return home, but in an effort to continue their work, must keep their nose to the grindstone of research and theory. How then, given these very real realities of tribal academicians do we educate the average tribal citizen in those things most necessarily for self-governance, protection of our natural resources, etc., things certainly not taught in our high schools? I truly believe that the answer can be found in the application of tribal writers and journalists to a life of the public intellectual. We need people who can digest the work of our academics in useful and applicable ways that encourage and inform our civilian lives and citizenship responsibilities. So much understanding in tribal communities is an intuitiveness based in oral traditions and our relationship to place, while definining us as tribal people, must be built on if we are to engage those civic fields of battle that will protect the land, feed our children, preserve our cultures, re-engage our languages, care for our elders and our sick and defend our ceremonies and spiritual knowledge. We are not unaccomplished peoples. If anything, many of us tribal members suffer as much from the lie of American exceptionalism as do many other Americans. Our best and brightest are encouraged to go away to college and then when they try to come home, they are not supported with jobs, vocations or even at times, simple acceptance. Those families pushing their children to ‘succeed,’ are often as caught up in the idea of education as the ‘ticket’ to ‘making it’ financially. We might encourage them to serve the people in some way, but rarely is that way validated and shaped for all those who do not go away to college–children growing up, having children of their own, struggling with substandard living and wages and other issues. If we do not support our young, educated tribal members, I am convinced we also do not support our young tribal members who do not leave their communities. So, as an average person who has a knack for ideas and explaining ideas, mostly through writing, I am compelled by this idea of the public intectual. As a tribal member, mother, writer, journalist, newspaper editor, homemaker, etc., and overall generalist, I am very much interested in seeing more and more of our tribal academics’ works getting to tribal people via newspapers and other media, as well as critiques and reviews and other items that further challenge, shape and condition the tribal public discourse. While much of media is talking heads and sheer ignorant stupidities on the part of the American public, my sincerest hope is that within even the next 10 years the same will not be said about communities of the Oceti Sakowin Oyate. That we can immediately begin bringing a greater depth to tribal newspapers and all newspapers in our treaty lands. Recent protests and actions against large corporate expansions on our reservations have been met with brave protests by people, but more must be done. Bravery can take us only so far, but armed with the research, knowledge and statistics of our own tribal academics, we can begin to truly make some headway. I am not a public intellectual, but I aspire to be. In some ways, it is a great relief. I no longer have to feel guilty for not getting further in my education, for ‘failing’ to leave our treaty lands for success elsewhere, applying myself to academia, foregoing journalism for tenure, or worrying myself on how to juggle success and motherhood and family life. I know that I am not alone in this…our ambitiousness as tribal people can be as much of a downfall in accomplishing meaningful community and family building work as too little ambition. I am heading home today, to my sons’ reservation, a couple hundred miles north of where I am enrolled. It’s all treaty lands, it is all part of the Oceti Sakowin Oyate, and while there’s a great deal of work to be done and questions to be asked, I am inspired and content to begin that work. I truly hope more will join me. Mitakuye Oyasin.